Several previous astrobites have discussed the subject of intermediate-mass black holes – objects with masses somewhere in between those of stellar-mass black holes, the compact remnants of stars gone supernova, and supermassive black holes (SMBH), the monsters weighing in at several million to several billion (or more!) solar masses, which are found at the center of every large galaxy. Intermediate-mass black holes would fill in the several-orders-of-magnitude gap between these two classes of objects, with masses somewhere between 1000 and 1,000,000 times that of the sun. While there are certainly theoretical grounds for intermediate-mass black holes to exist, finding them has proven something of a challenge. The authors of this paper seek to take on that challenge by using a clever technique, the X-ray variability of black holes, to try to scout out some of these elusive objects. Before we get to the subject of X-ray variability, it’s probably worth explaining why we expect intermediate-mass black holes to exist. The current paradigm for galaxy formation is known as bottom-up growth – large galaxies are expected to grow from smaller galaxies through mergers and accretion events. We now think that every large galaxy has a supermassive black hole in the center, so it makes sense that as the galaxies grow, so do their central black holes. This means that not too long ago, there should have been a lot of slightly less massive black holes, that merge and accrete matter right along with the galaxies that host them. It is this class of objects that the authors of this paper seek to find. So if we can find supermassive black holes in the centers of galaxies, why can’t we find their smaller siblings? The answer is essentially because they are smaller. Accretion disks around intermediate-mass black holes aren’t as bright, so they are hard to locate optically, and they aren’t as luminous in X-rays (the most efficient technique for detecting SMBHs), which also makes them harder to pick out. However, there is one advantage of having a smaller black hole. Because the black hole is not as massive, its event horizon (the point beyond which nothing that falls in can escape) is much closer. This means that we can see light-emitting material at a smaller radius, which in turn means that we can see material that is changing on a more rapid timescale. Smaller emitting regions can change on more rapid timescales because the amount of time it takes for information (light) to travel across them is shorter. In addition, because the accreting material is closer in, it is hotter, which means intermediate-mass black holes actually have spectra that peak at shorter wavelengths, generally in the soft X-rays (below 10keV), than supermassive black holes, which peak in the UV. Figure 1. The X-ray light curve for one of the 16 candidate black holes. Note the high level of variability in the source (black line), as compared to the X-ray background (red line). The authors of this paper seek to capitalize on the above relationship. They note that the more variable an object is in the X-rays, the more likely it is to be a smaller black hole, because accretion disks around intermediate-mass black holes vary on shorter timescales and peak and shorter wavelengths. Thus, they decided to search the XMM-Newton Serendipitous Source Catalog, a public catalog with 262902 X-ray sources discovered by the XMM-Newton space telescope, for highly variable objects. After culling their resulting catalog to remove sources unlikely to be black holes, the authors ended up with 59 sources, 16 of which have not yet been published as active galactic nuclei (AGN) (the name given to an actively accreting black hole at the center of a galaxy). 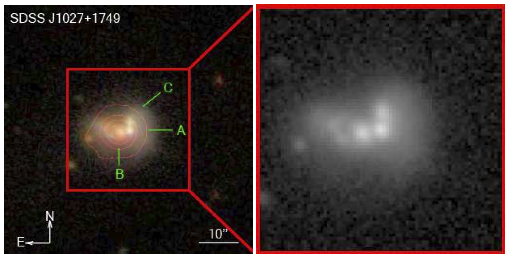 Once they had selected the objects, the authors wanted to determine whether these black holes are indeed smaller than those usually detected in the center of galaxies, and in addition, how quickly they are accreting material. 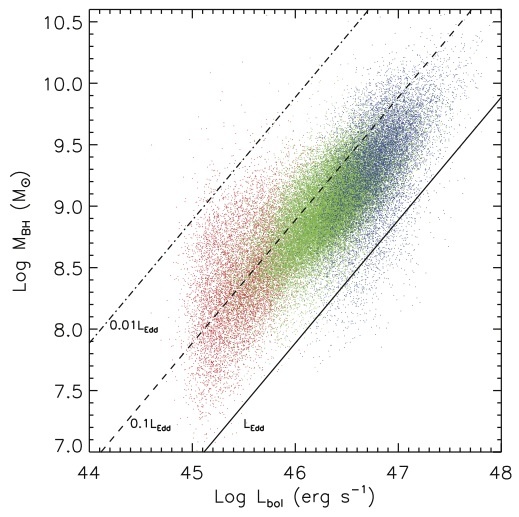 To find the black hole mass, they used a correlation between the variability of AGN and their masses to calculate the mass of each black hole in their sample. This is essentially just the relationship discussed above, in which black hole mass is anti-correlated with variability. 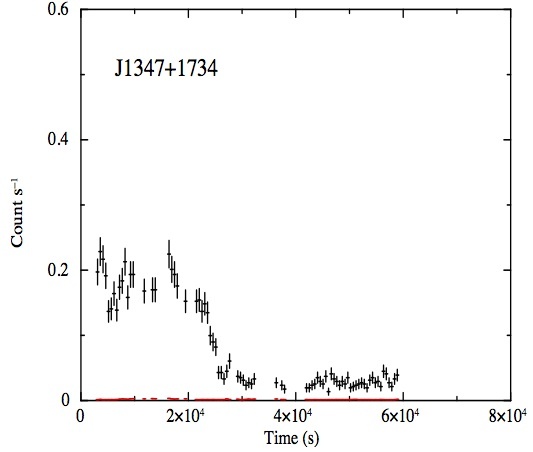 Figure 1 shows an example of the X-ray time series for one of the black holes, with X-ray counts on the y-axis, and time on the x-axis. The calculated masses of the 16 objects in the sample ranged from 1.1 – 6.6 x 10^6 solar masses. While these masses are a bit high for the label of intermediate-mass black hole, they are nonetheless much smaller than most of the supermassive black holes known. Figure 2. Bolometric luminosity vs. black hole mass for 9 of the candidate black holes. The solid line shows the Eddington luminosity. To quantify how quickly the black holes are accreting, the authors used their Eddington ratios, which describe how luminous a black hole is compared to its Eddington luminosity. The Eddington luminosity is the maximum luminosity a source can have in order for its radiative pressure outward to balance the gravitational pressure inward. The Eddington luminosity of a given source is a constant that depends on its mass. Because objects that are accreting more material are more luminous, the Eddington ratio is thus a measure of how rapidly a black hole is accreting material. 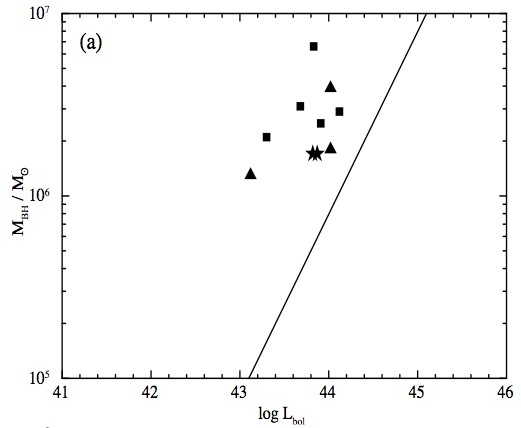 Figure 2 shows a plot of the luminosity vs. mass of each of the 9 black holes for which the authors had redshift information (distance is needed to calculate the total luminosity of a source). The solid line in the plot is the Eddington luminosity for each source. Most of the objects appear to have relatively high Eddington ratios, in the range 0.1 – 0.6, which when compared with the 0.01 – 0.1 that is typical for supermassive black holes, means that these objects are accreting at a very high rate. Because growing black holes should have relatively low masses and high accretion rates, the authors claim that these appear to be good candidates for the theorized population of adolescent supermassive black holes. I am a graduate student at the University of Arizona working on high resolution simulations of galactic winds, run with my new hydrodynamics code, Cholla. When I'm not doing astronomy, I enjoy essentially any outdoor activity, including hiking, rock climbing, and walking my dogs. On indoor days I can often be found reading, and of course, drinking coffee.